Check out this $4.00 coupon on the Wisk Facebook page! 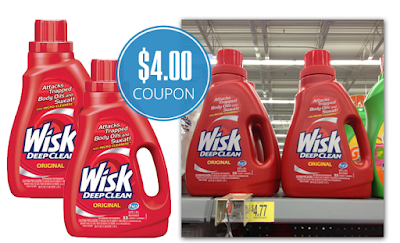 Save $4.00 on the purchase of two bottles of Wisk detergent. Don't forget to hit the back button and print two coupons! Giant has a 33-load bottle for $4.99. Buy two, use the coupon, and pay $2.99 each. That’s a great price. Be sure and “like” the Facebook page of products you use. I often receive special coupons and discounts this way! Total $5.98 or $2.99 each after coupon!